Yesterday was a pretty amazing day all around. First of all, it was hot, really hot. When I left work at 5, it was 90 degrees out, not too shabby for the fourth day of May. I love that kind of heat so it was a pretty fantastic feeling to eat dinner outside at Taqueria San Jose with my sweetheart, no sweater. From there we ambled up the street, hand in hand, and saw the documentary I Am at the exquisite Rafael Theater. 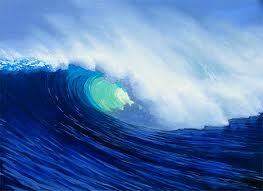 The wave of energy that we've all felt - many of us for years - is coming ashore. It is building height and power, and if you expect to hide out in any concrete structure, you are making a big mistake. All the rules are changing. The old institutions and patterns of life that our social selves have been trained to believe in are being uprooted and will soon float away. This is only a crisis if we cling to them. The way to be safe - more than safe, joyful and delighted - is to climb on board the smallest, lightest, most nimble platform you can find. For some of us, that's an entrepreneurial business. For others it's knowing a trade - like horse whispering or life coaching - that will make sense of the wild new world for the people we hope to serve. I don't know what your surf board looks like, but I know you own one. It's built into your soul, and that is the only place you'll ever find it. Martha gave me chills of recognition the first time I heard her speak, when I didn't know who she was at all and was generally haughty and suspicious about the very notion of life coaching. She opened her mouth and undid me completely. Freaking spooky. And so yesterday started out with this feeling of It's All Happening thanks to Martha, which was only compounded by Abby Tucker an hour or so later with her recommendation of the book, "Making Waves: Irving Dardick and the Superwave Principle," which takes as its premise that all matter moves in interconnected waves. So as the capstone to that day, I Am was pretty perfect. Everything kept sweeping (waving) around full circle for me as I sat in the dark theater, sometimes crying, sometimes laughing, a lot of time wishing I could hit Pause and scribble notes. OK, and a lot of time falling in love with Desmond Tutu over and over, such a delightful creature. But honestly a lot of the time thinking DUH, of course, that's what we're doing every yoga class, silly Tom, I'm sorry you had to have a head injury to arrive here, in KansOz with the rest of us. Come to class, Tom Shadyac! It was delightful to see up on the screen, in different forms, what we hear every time we sit on our mats together: these constant reminders that we're all one, connected seamlessly in one fabric. Delightful to hear it again, from different, much more famous teachers. That only Love can heal us all, only Love for self and others is the way out of the global crisis of greed and destruction we're in right now. It was super-spooky and super-right, and naturally, exactly what I needed. And so today I feel a little raw but also really ready, cracked open and ready to bring it. See the movie if you haven't, but mostly get to class, sit in community, revel in this super-connection of which we are a part. Because if yesterday taught me anything, it's that this wave we're in, it's us. What's the best thing that could happen to the world? We Are.